Meringue, is a type of dessert made from whipped egg whites and sugar, and occasionally an acid such as citric acid. A binding agent such as corn starch may also be added. It is a traditional dessert mainly served together with whipped cream and fruits or in combination with baked products. The key to the formation of a good meringue is the formation of stiff peaks and firm up through the heating process afterwards. Flavourings such as vanilla and lemon can be added to meringues to enhance taste. 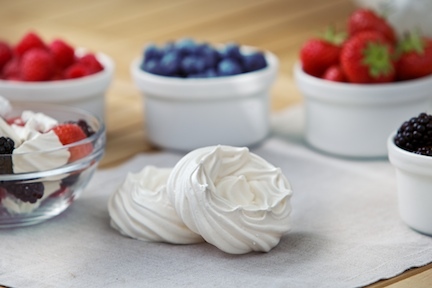 A number of approaches can be used to reduce the cost of your meringue recipe and your production processes. Our team at KaTech can advise you on how to create a great product for less.